24 year old Luisa Murilla holds onto her lead as she heads the pack towards the finish line through the Chaos! Day 4 of the Women’s Pathfinder Marathon challenges racers with a steep descent down the Tithonium Chasma and through the canyon systems of the Candor Chasma. The 200 km course takes place over the course of a single day. Athletes will need to navigate their way through unpredictable and cracked terrain appropriately named the Candor Chaos. Stage 3 marks the halfway point of the entire marathon and racers are starting to run ragged. Murilla and Kang battled it out at the start of the course as they jostled for first. However, a risky gamble by Kang to jump a rocky gully sent her stumbling. It cost her precious seconds, and the lead. Not only was she unable to regain her position, Kang was quickly overtaken by fellow racers and finished in 11th place. 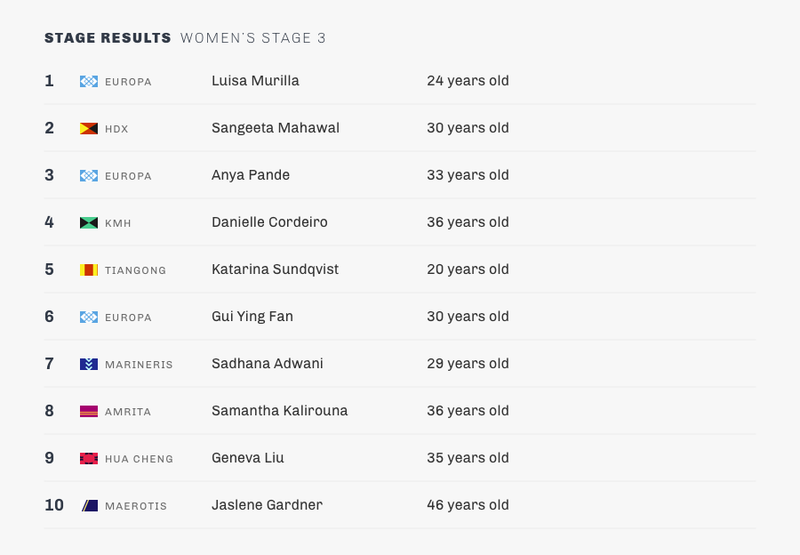 Sangeeta Mahawal of Amrita gave an impressive performance as the 30 year old came in second. Mahawal had a rocky start—a stretch of loose rubble along her chosen route forced her to forego her running blades. But by the afternoon, Mahawal had caught up to the rest of the racers. "I knew had to be really aggressive to make up for lost time," she said. Nine racers were eliminated from the running. A careless step sent Marineris runner Ida Horn crashing to the ground and irreparably cracked her life support pack. Support drones were able to quickly pick her up before she suffered from prolonged exposure to the Martian atmosphere. Other racers were unable to complete the course due to sheer exhaustion and the end of the day saw 20 challengers left of the original 40.